Greeting. FINALLY, Oprah Winfrey, a ‘Childhood Trauma’ (#ACEs) victim-survivor, addresses America’s easily PREVENTABLE, though potentially life scarring PUBLIC HEALTH CRISIS. May I share medical knowledge about America’s expanding “Public Health Crisis” Oprah Winfrey states she recently became aware of? Perhaps training, conditioning, educating our Nation’s most precious assets to believe it is okay to ‘snitch’ by reporting to their school officials “Suspected Cases of Child Abuse, Emotional Neglect and Maltreatment”, will help reduce the number of abused, emotionally neglected and maltreated children maturing into depressed, angry, frustrated, sometimes suic!dal, homic!dal thinking teens and adults (*May 18, 2015 – Rise in Suic!de by Black Children Surprises Researchers – The New York Times*) largely lacking compassion, empathy and respect for their peaceful as well as less fortunate neighbors? I write about and share evidence of America’s MUCH IGNORED, oppressive, potentially life scarring black or African American *MATERNAL CHILD CARE* #T_H_U_G_L_I_F_E NATIONAL PUBLIC HEALTH CRISIS that I, as well as a growing number of my reasonably responsible, caring, concerned American and foreign born neighbors believe is impeding our black or American friends, neighbors and co-workers of African descent from experiencing the equality and respect all peaceful, reasonably responsible Americans are entitled to enjoy. Unfortunately, before he developed the confidence to properly promote his #THUGLIFE Child Abuse *AWARENESS* concept, Tupac was brutally murdered by OTHER emotionally or mentally ill victims (*May 18, 2015 – Rise in Suic!de by Black Children Surprises Researchers – The New York Times*) of America’s Culture of African American Child Abuse, Neglect and Emotional Maltreatment evolving from America’s multi-generational, ignorant, once legal Culture of Racism. 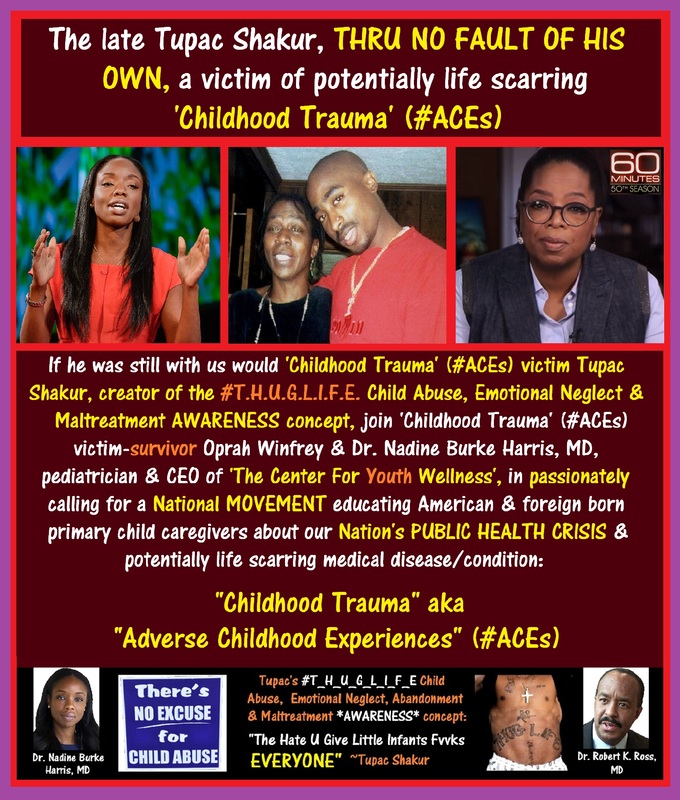 In her own way, Dr. Nadine Burke Harris, M.D., pediatrician and CEO of ‘The Center for Youth Wellness’ joins Tupac Shakur, the late American urban story-TRUTH-teller and creator of the #THUGLIFE Child Abuse, Emotional Maltreatment & Neglect *AWARENESS* concept, in PASSIONATELY speaking about the relationship between Adverse Childhood Experiences (#ACEs), aka *Childhood Trauma*, and later-life health and well being.